I recently made lasagna with tomato sauce using the recipe I posted here My First Tomato Sauce Lasagna. So yes, I use jarred sauce because otherwise I would never make the lasagna because I am kinda not a big fan of tomatoes so I know I would not make a good sauce. I like this one (pictured). I didn’t use the whole jar though. I didn’t measure either. I just put what I thought was about three cups or more, but I wanted to save a little sauce for pasta. We don’t usually have pasta with red/tomato sauce, because . . . . well, you know. But the other night I was trying to figure out what to have for dinner. I had just cooked ground turkey and if it were just me, I could eat that almost every night, but recently I was told by my husband that he could not. So . . . . there was chicken in the freezer, but it was not in a marinade bag so . . . .what to do? Then I remember that ol’ recipe where you pour tomato sauce over the chicken and top it with cheese. Just like the Salsa Chicken, I had never done that because . . . . well, you know. 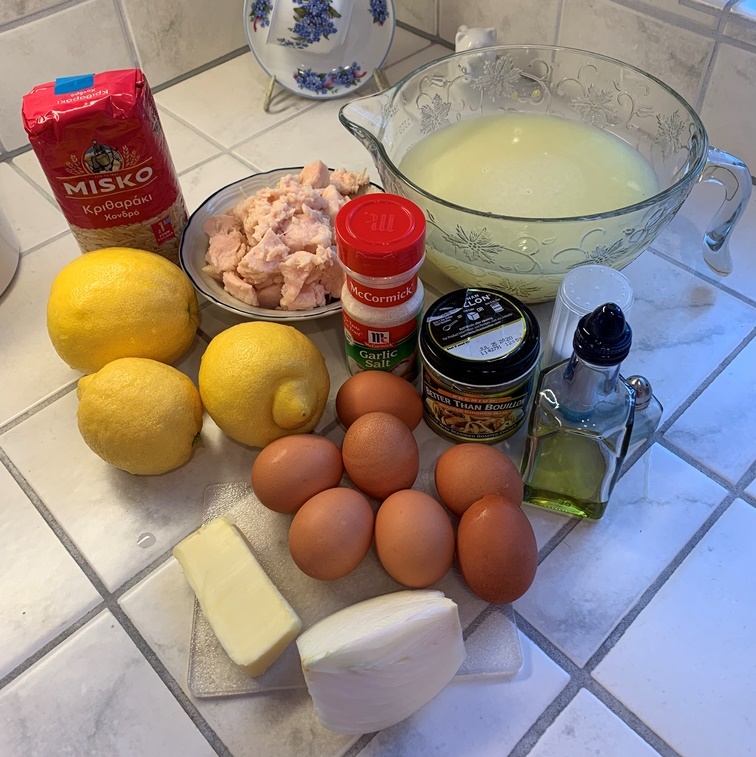 So I decided to try it because it would be something new to us even though it is an old recipe. So I made Tomato Sauce Chicken, I think of it as Italian Chicken. So easy and so good, just like the Salsa Chicken. 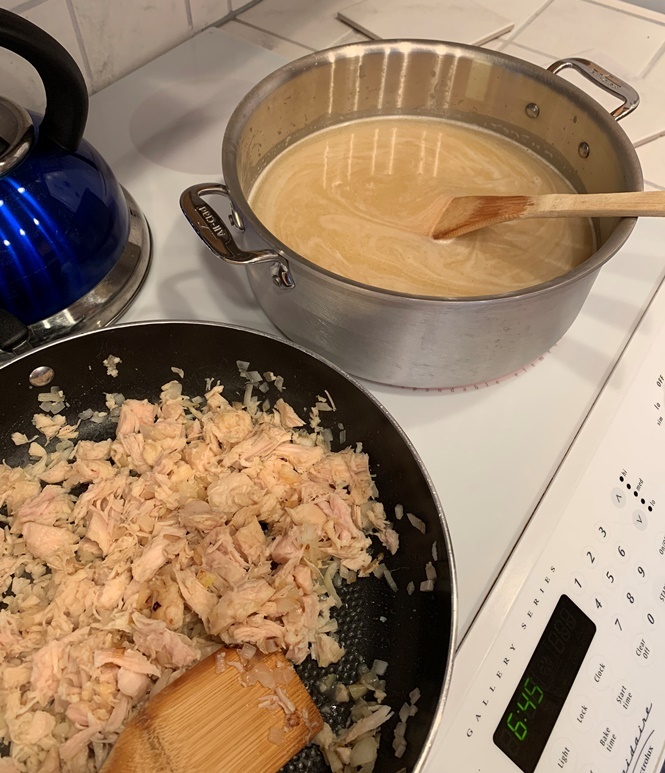 This time I had what I think of as regular chicken breast (instead of the thin ones I had for the Salsa Chicken), but I decided to cut them up into smaller pieces because I was going to serve them over pasta. I didn’t have that much sauce, but that was fine with me. After I made it and ate it, I realized that I probably could have been eating something like it all along as long as I hadn’t followed the recipe and drown the meat in tomato sauce. The little bit I had and used was perfect, to me. Preheat the oven to 350° F. Spread out the chicken pieces in a baking dish. Sprinkle the chicken with the poultry spice and garlic salt. Bake for 10 minutes. Take the dish out of the oven and turn each piece of chicken over. Sprinkle the chicken with the poultry spice and garlic salt. 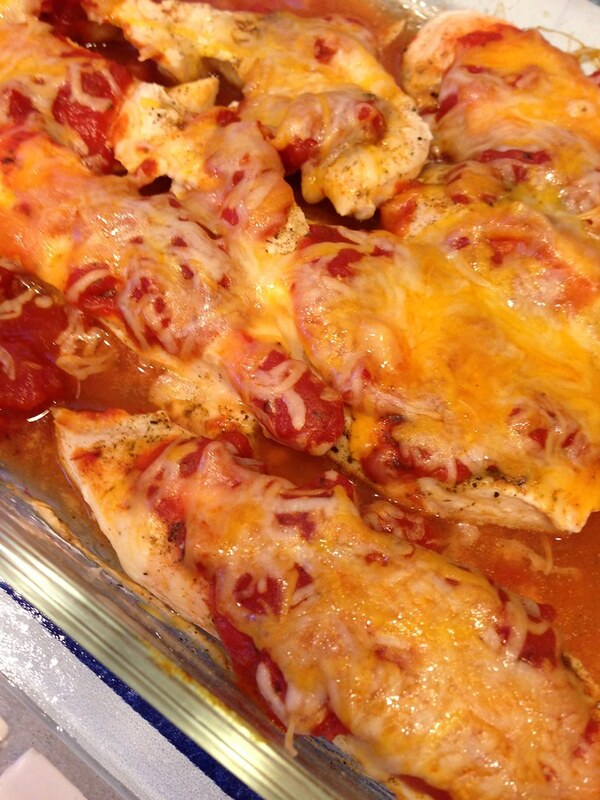 Spread the tomato sauce over each piece of chicken. If you LIKE tomato sauce use more. Then top each piece of chicken with cheese. Bake until chicken is done to your liking. I baked it for 10 more minutes. Turned off the oven and let it sit for 10 more minutes. I served it over linguine. I put some of the tomatoes and the “juice” on the pasta. Yes, this recipe is easy. And yes, you can figure it out on your own. You can add and subtract, but sometimes do you just need ideas? You need a starting point? I do. I actually have always thought about trying this but my dislike of tomatoes kept me from doing it. But now I am more tolerant of them. I would imagine it would be really good with mozzarella cheese, but we had the Mexican Blend type of shredded cheese. And that was actually really good. The chicken we buy from Costco is packaged in twos and they are rather large so we have enough for another meal. Yeah . . . you probably know I love leftovers as much as you know I don’t really like tomatoes. So what are you having for dinner tonight? I love eggplant. I read a blog called Dinner of Herbs and she posted a recipe for Eggplant Bruschetta. Yum. I used to not like bruschetta because I didn’t like tomatoes. But I like it now . . . well it depends. 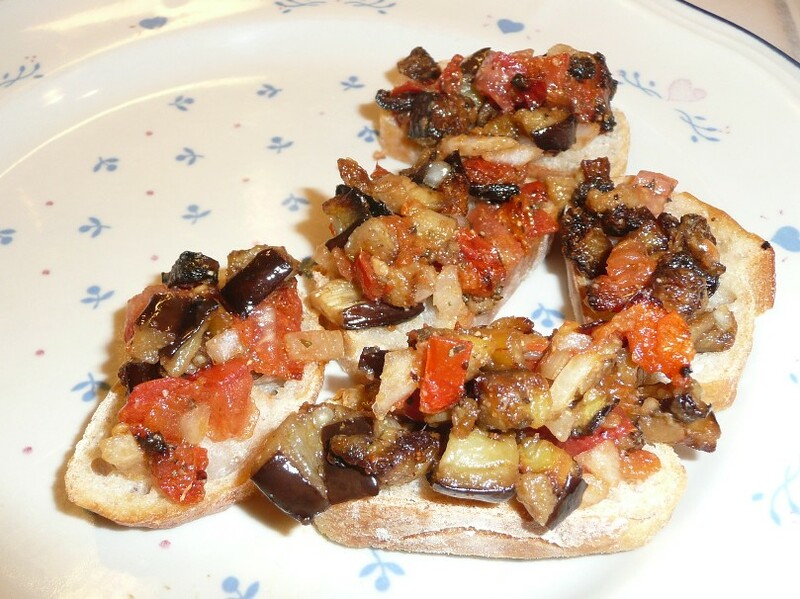 I like some bruschetta and since I love eggplant I thought I would like this. As I was making it I laughed because she only listed amounts for two of the ingredients and it turns out I didn’t use the amounts for those that she stated. Also, I had to laugh–yeah, right!–because I went to the grocery store on Thursday right after my Nia class. I like to do my shopping while I am already out, so on my way home I stopped by the store. My WHOLE reason for going was to get the ingredients for the bruschetta! I even wrote them down. But while I was there I thought of a few other things and completely overlooked one KEY item on my list. I forgot the bread. DUH! Can’t really make bruschetta without the bread. I used to think bruschetta WAS the bread. Then I came to think bruschetta was the tomato mixture. But bruschetta is the bread topped with the tomato mixture. Eggplant bruschetta just has eggplant added to the mixture. Since I like to run all my errands while I am already out I decided to wait to get the bread on Sunday after my rotation of teaching Nia at the YMCA. HOLY MOLY! My husband is under strict instructions to remind me never to go to the grocery store on a Sunday. Geez louise. I was there over an hour. It was so crowded. But I got the bread! I got two different kind since my husband doesn’t really like bread and he really doesn’t like hard sourdough. So you can imagine he doesn’t like TOASTED sourdough. So I got him some wimpy soft bread and I didn’t even toast it. Anyway . . . for Dinner of Herb’s recipe I used a very large eggplant and I cut it up into tiny cubes. Way smaller than she shows on her site. I put garlic salt on it. I roasted it for 45 minutes. I only used three tomatoes for roasting. I also roasted them with garlic salt. Then I added a half of a raw tomato along with about two tablespoons of raw chopped onion to the mix of roasted eggplant and tomato. I actually always thought that bruschetta was raw tomatoes so that is why I added some raw tomato. So I loved it. My hubby ate it. As I said he is not a bread fan so he was not at all excited about it as I was. I thought it was delicious. I think it is so delicious I am going to make it again, but just the eggplant-tomato mixture and put it over pasta. I am excited about this because – as I just said – it is something else to do for pasta, or heck . . . .anything. To me it is that good that I would just make it as a “salsa” to put on chicken or pork. I have to say that I did not take good pictures. I was kinda in a hurry. And if you take pictures of food, you know you can’t do it when you are rushed. So . 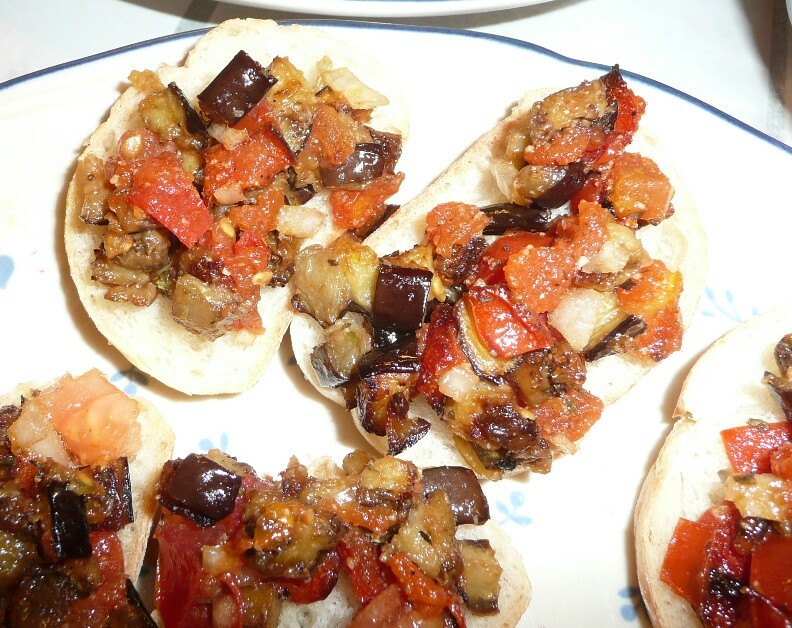 . . .sorry the pictures are not very appetizing, but if you like eggplant and if you like bruschetta you will love this! Do you like bruschetta? Do you like eggplant? What other type of bruschetta do you make? So I am not always a big fan of salsa. I am not always feeling the love for tomatoes and I am NEVER feeling the love for the hot spicy of most salsa. Most of the time I will just “wet” my chip in the salsa. Since tomatoes aren’t something I really like I don’t usually like Pico De Gallo. Recently I saw a pico de gallo recipe with cucumbers in it. Yes, I know there are a lot of different types of salsa and chunky “salsas”. You can make what people call salsa out of anything now a days, just like you can make “aioli” out of anything even though aioli is “traditional sauce made of garlic, olive oil, lemon juice, and egg yolks” and salsa and pico de gallo are traditionally made with tomatoes. This was a tomato pico de gallo but it has cucumbers in it. I thought that would be cool. I saved the recipe with a plan to make it later. Then one day, the day I was detoured by that little produce store on my way home from Nia Class in San Jose, where I bought my broccoli, I bought some tomatoes too. I was thinking I would make that pico de gallo. I knew I had cucumber and cilantro. Well, as sometimes happens, I didn’t get around to making it right away. I ended up using the cucumber I had for salads. Of course, by the time I got some cucumber and decided to make the pico de gallo my cilantro was a bag of mush. That stuff goes fast and it was the bottom shelf so I hadn’t seen how bad off it was. So I ended up not having cilantro. But I had fennel. I thought I could try a “pico de gallo” with fennel tops. Not a traditional pico de gallo anyway because it has cucumbers in it. Since it was not going to have any cilantro and fennel is not very strong I put in a lot of onions! A LOT. For me . . . too many. I think it made it too hot. But my husband liked it. The original recipe can be found here. 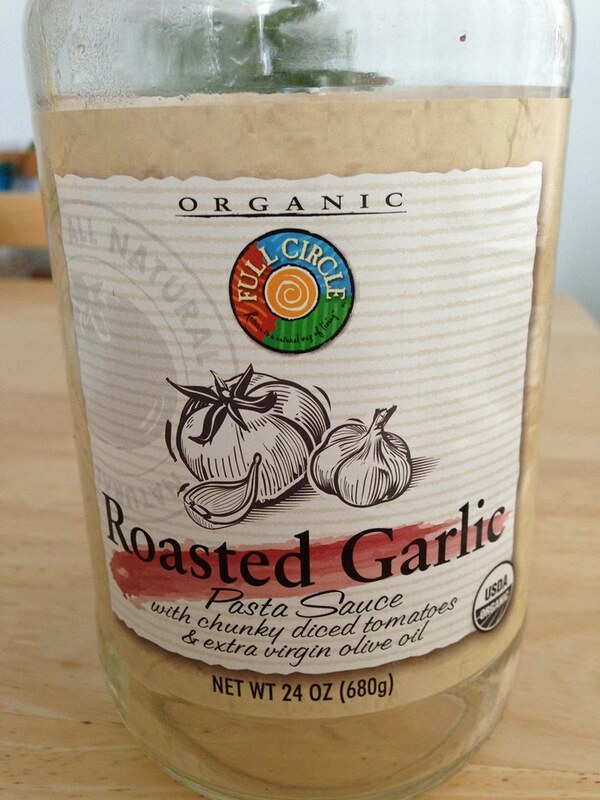 I pressed the garlic in a garlic press, then combined all the ingredients. I let it chill for a few hours. My husband liked it. But he is really easy to cook for because he likes pretty much everything. But he said it was good. I think the onions carried it. I am not sure the fennel was strong enough to add that much of a flavor. But I know it was very different than pico de gallo with cilantro. The next day there was some left over and I added avocados to it. I didn’t even taste it because I don’t like guacamole, but my hubby enjoyed it. I might actually try this again with the actual fennel BULB! I really like fennel! And I LOVE the idea of cucumbers in pico de gallo! What do you put in you pico de gallo? Do you make chunky salsa? When you do something, like Nia or use a blender every day, it gives you a lot of material to post on a blog! I’ve been using my birthday present almost every day. When I first heard of “super” blenders that made soup I thought that was crazy. I thought that the blender had a heating element to heat up the soup. And there are some like that. But with the high-speed blenders, I didn’t realize the blades go fast enough to cause heat and heat up the soup. They go so fast it is hot! I didn’t think it would be something I would like. 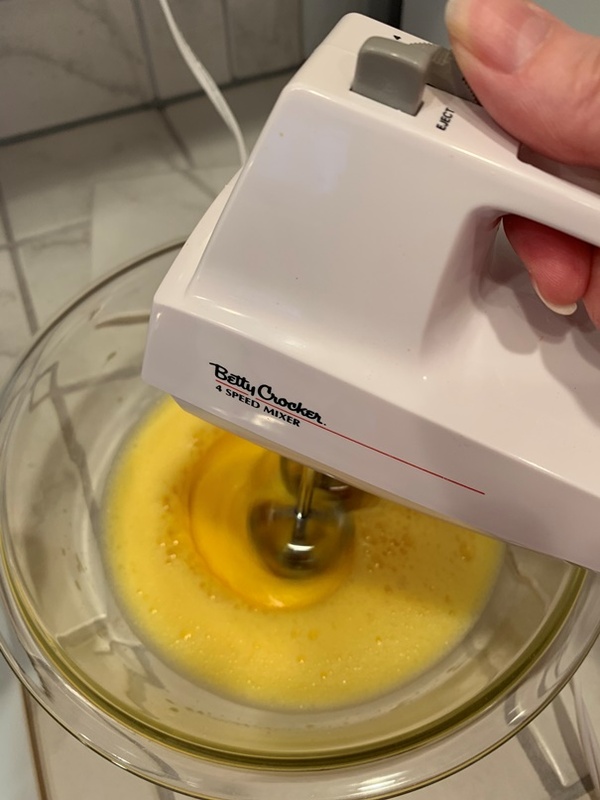 As you may know I love to make soup and one of the things I love about the soup I make is the fact that I do it all in one pot and then I use my immersion blender. I really like that. I don’t like having to pour cooked soup into a blender then blend it then pour it back into the pot to re-warm it. 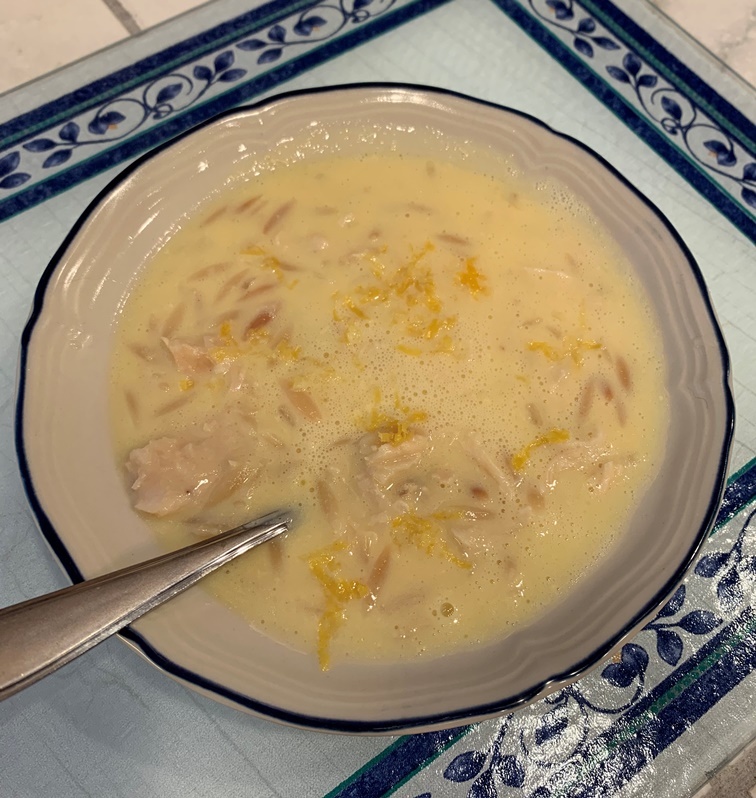 The soup recipes that I have seen for blender soup either have you doing that or have you cooking some if not the majority of ingredients before putting them in the blender. At this point, for some of my soups I will stick to my one pot and stick blender recipes. Another reason I like to make the soup in a pot is because I believe that cooking some of the ingredients as you go allows you to layer the flavors. 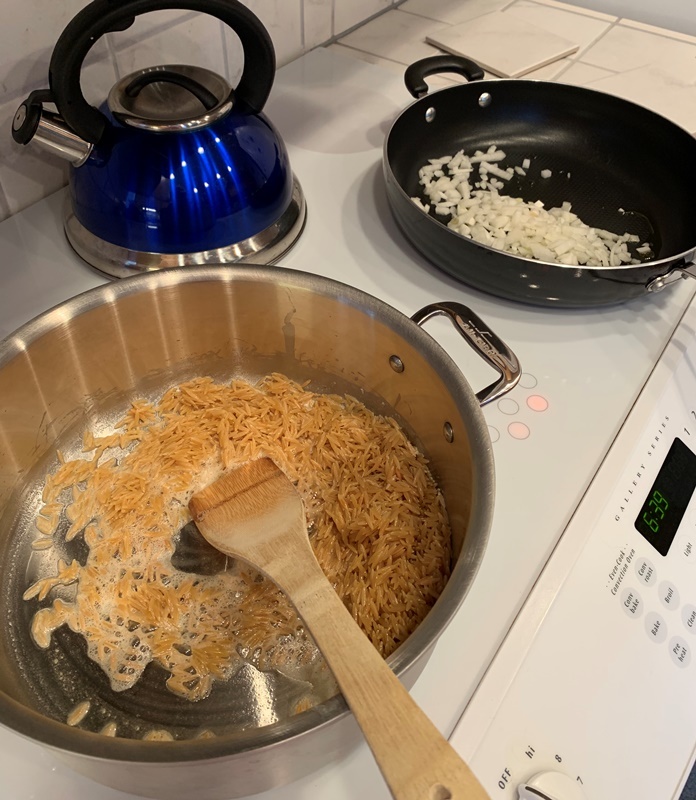 Now, I know that phrase from cooking shows and I could be off base with what it means and what I am doing, but that is what I consider myself doing when I sauté onions and then garlic and then add the butternut squash and sauté it. Then add other spices, etc. It layers the flavors. But in a lot of the blender soup recipes you just dump it all in. Well, since I got the dang thing I decided to at least try one of the recipes for soup. I picked a recipe that does not require any other cooking. 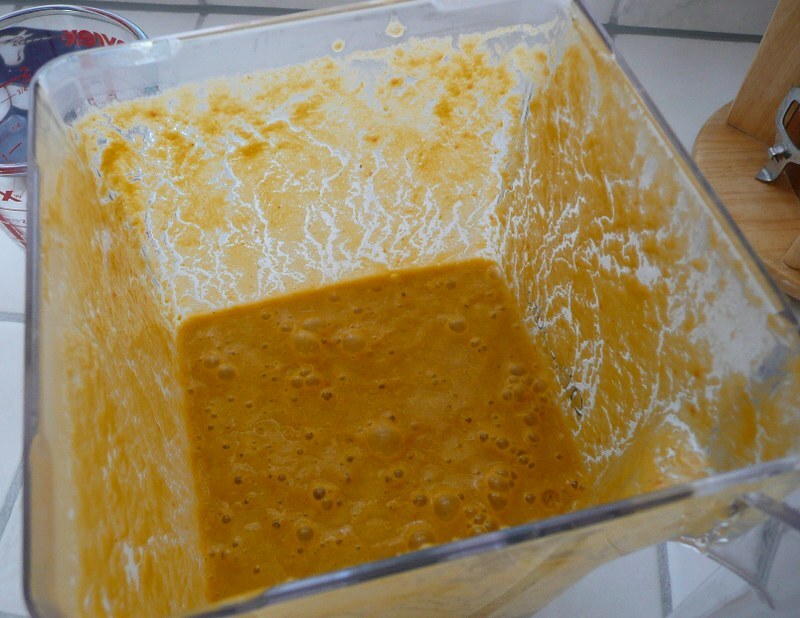 Just dump all the ingredients in the blender container and press soup. Now with that kind of ease I could maybe live without the layer of flavor if I liked the soup. I like it ok. I think that if I followed the recipe exactly it would have more flavor, but I also think that if I follow the recipe exactly it would be too hot for me. 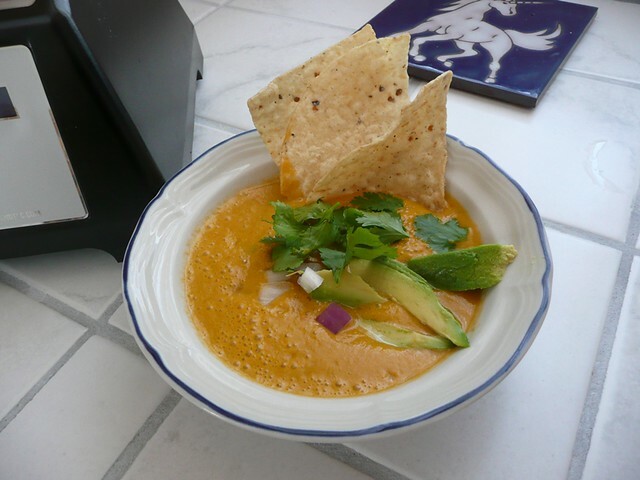 The recipe that came with the Blendtec Blender and is on their website is for Tortilla Soup. The ingredients go into the blender in the order that they are listed then you press “Soups” on the blender and let it do its thing. It does really go so fast that it actually does get hot! Some people might like their soup piping hot so this MIGHT not be hot enough for them. But this type of soup is perfect at the temperature that the blender makes it. It was not spicy because I didn’t use the pepper jack. I bet if you like that hot (spicy) cheese the soup is good with it. I will make it one day with the pepper jack because even if it ends up being too spicy hot for me, my hubby will eat it. For now, I am just using the Monterey jack. The first time I made this it took me 30 minutes because I was going slow. The second time I made it, it was ready to eat in 20 minutes. So my title, So Fast It’s Hot, applies to the blades of the blender AND to the fact that this can be made and in a bowl in 20 minutes. Now that is HOT! Before I got the blender I had an opinion about blender soup, what about you? What do you think about blender soup? When I first started looking into different types of diets (READ: NUTRITION PLAN/WAY OF EATING), I was curious to always see Nightshade Vegetables mentioned. One diet that I have talked about is the anti-inflammation diet, this diet does not contain nightshade vegetables. You might know what they are and what that means, but I have mentioned before that I am not a gardener. I am not a gardener and even more so I have no idea about vegetable families and their classifications and stuff. I keep having to look it up. What is a nightshade vegetable? Nightshade vegetables are from the Solanaceae Family. Nightshade vegetables contain a group of chemicals found in plants called alkaloids. There are different types of plant alkaloids, some being toxic. Plants containing alkaloids have been used for medicinal purposes as well as stimulates and poisons. Studies have proven that alkaloids can affect some of the functions in the body. Some people are more susceptible than others. These vegetables are thought to interfere with digestion, muscles, and joints. Nightshade vegetables promote inflammation in the body. If you are susceptible to them it might be beneficial to limit consumption of these types of veggies. As I mentioned if you are on an anti-inflammation diet they might be forbidden all together. Again this could only be if you are sensitive to them. Or if you are interested in trying to reduce the amount of chronic inflammation in the body. If you have arthritis or any other disease associated with chronic inflammation it might be something to try. Or if you experience pain caused by sensitive nerves. Nightshade vegetables are very common. They are so common it kind of makes sense that chronic inflammation is more prevalent and being study by the medical profession. I think the most common nightshade veggies are potatoes, tomatoes, and bell peppers. You know I LOVE bell peppers and I was just learning to like tomatoes. And the issue with potatoes is they are yummy in so many forms; mashed, fried, baked, roasted. In addition to my beloved bell pepper ALL peppers are lumped in this family. So even the hot ones that might aid in digestion could be causing inflammation issues. In addition to inflammation there is research has proved that the alkaloid in potatoes interrupt signals from nerves to muscles and might contribute to muscle twitches. Next time you have a twitch try to remember if you had any potatoes. In addition to signal interruption, the chemicals contained in some nightshade vegetables might even cause pain Also some research has shown that the alkaloids leech calcium out of bones and deposit it into soft tissue. Eggplant is also a nightshade vegetable. I love roasted eggplant. Eggplant along with tomatoes contain nicotine. Yup, tobacco is a nightshade plant and nicotine is an alkaloid. It is fortunate that both tomatoes and eggplant contain a lot less nicotine then tobacco, it is still interesting to know. Cooking reduces the level of alkaloids in our veggies by about 40-50%. Please note that I am not saying that any health issue or discomfort you are experiencing is caused by nightshade vegetables/food. What I am saying is that some research has either proved or associated the alkaloids in nightshade vegetables/foods to be connected to certain things; inflammation, digestive issues, nervous system malfunctions, pain, muscle twitching, etc. and it is interesting to know. And it might be beneficial to do some experimenting with your diet if you think you might be sensitive to the chemicals found in some of the vegetables and/or spices considered nightshade foods. Did you know what veggies were considered nightshade? I am glad that I now have this list. Sometimes I learn things then forget them and have to re-learn them. I am surprised to see that botanically a bell pepper is a fruit. I don’t remember ever having learned that. I never understand how something is one thing, but we all call it another. What is up with that? Usually there has to be a reason. The information I’ve seen regarding tomatoes being a vegetable when they are really a fruit is tomatoes were considered vegetables because of taxes. Something to do with the difference between how taxes are applied to fruits and vegetables. This started in 1883. I don’t know why we consider a bell pepper a vegetable and not a fruit. Also, it is called a pepper when it lacks the ability to produce the chemical that causes “heat”. I do now know that the different color bell peppers are a result of harvesting. The green ones are not fully ripened. Usually the order is green, yellow, orange, then red. Since the yellow, orange, and red ones need to be on the plant longer this is why they are more expensive. I have experienced them to be upwards of five time more expensive than the green ones. To me I think of them as green, red, yellow, orange, in terms of sweetness. I find that — again, I want to clarify: to me — the orange ones are the sweetest. So it is confirmed in my mind, the same species of bell pepper plant produces the different colored peppers because they are a factor of ripeness (or not in the case of green bell peppers). They are not different types of plants or different colors due to anything artificial. I would like to try a purple one. I have not even seen one in a long time. Have you ever seen one? The different colors have a different nutritional values. I posted about the green and the red before. Do you like bell peppers? Is there a color you prefer? Beautiful and sweet. I could have sworn the tag said lemon tomato. I don’t think we saved the tag. As you may know I just started eating tomatoes within the past couple of years. My mother-in-law grew Zebra Tomatoes and I started my tomato journey with them. I have come to realize that I do not care for mushy tomatoes. I like them firm, maybe even on the just-before-ripe side. Also, I like them raw not cooked. So I was watching the tomatoes my Wonder-Hubby planted very carefully. Now, you also may know that I don’t know the first thing about gardening and ripe or not so I rely on my hubby to tell me. He is a fantastic gardener when he has time. He can make on-the-brink-of-death plants come back to life. I was watching the one tomato that was yellow very closely. But obviously not close enough. 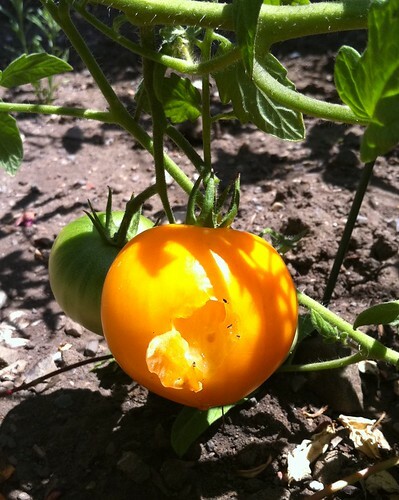 One afternoon while I was doing Nia in my living room I glanced outside and I noticed the tomato looked odd. I went to investigate, something had tasted our tomato. I was very sad. I was wondering if taking it and cutting off the “tasted” portion was too gross. I hadn’t examined it to see how much damage had been done. I posted my sadness (either on FaceBook or Twitter) and other people said that they would eat it as long as you were able to cut off all the evidence of “tasting”. Once I assessed the damage and I concluded that whatever tasted it just peeled and poked a little so I cut the fruit in half making sure there was nothing on the half I was planning on eating. Then I cut it up and shared it with my hubby. It was sweet. I was surprised. I looked online to see if I could find some information about them to post, but there are a lot more than I realized and now I am not sure which ones we have. They kind of look like Lemon Boy but I am not sure because they are much smaller. What do they look like to you? Do you know tomatoes? Whatever they are, they are very tasty. They are somewhat sweet and really taste more like fruit to me. We wanted to grow Zebras but couldn’t find them. 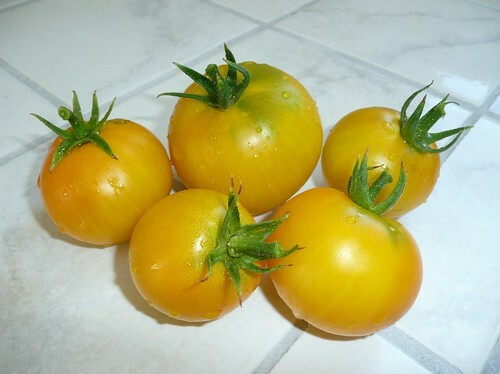 Which is somewhat good because now we have tried a new (to us) tomato. So many people grow tomatoes. Do you? What kind? I don’t really like tomatoes. I have never liked tomatoes. I used to NOT eat pizza because of the tomato sauce. Spaghetti and tomato sauce? Forget about it. BUT . . . . tomatoes are really good for you. And so I try to eat them and I try them every once in a while. Since they are good for you I think they make a healthy snack. This is what I had as a snack prior to doing a Nia workout. I don’t really like them so I add a little special seasoning (pre-made garlic and salt mix). 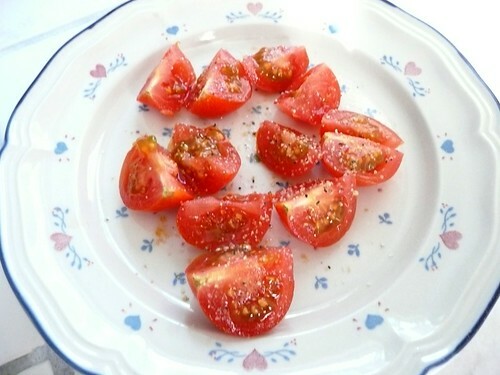 Tomatoes contain antioxidants, vitamin C, vitamin A, potassium, and iron. They are even touted as having cancer fighting properties. Amazing for a fruit with so little calories. Do you like tomatoes?